This 500-piece jigsaw is designed by Jenny Newland and measures 18" x 24". 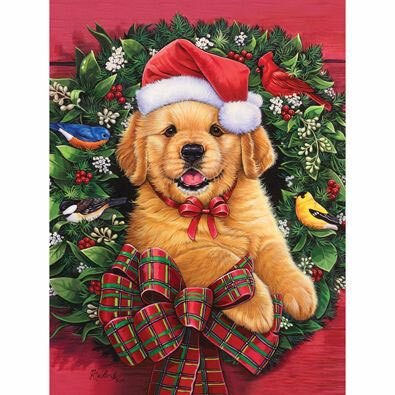 A festive puppy sits in the middle of a Christmas wreath. Lighthouse Park is a 500 piece jigsaw puzzle designed by artist David Maclean. Waves pound the rocky coast under the lighthouse on the point. A rainbow appears near the water as the sun sets creating an colorful orange sky. Available in two piece counts. This 500-piece jigsaw is designed by Jane Maday and measures 16" x 20". Several birds make themselves at home on these snow-covered branches. Available in two piece counts. Winter Full Of Wonders is a 500 piece jigsaw puzzle designed by artist Mary Thompson. Kids are having a snowball fight in the freshly fallen snow on this country farm. A family rides by in a horse drawn sleigh and children are making a snowman and skating in the background. Available in two piece counts. Love Is In The Air is a 500 piece jigsaw puzzle designed by artist Abraham Hunter. A buck and doe kiss among wildflowers in the forest. The orange and reds of changing leaves on the trees fill the colorful background. Available in two piece counts.